I have mixed feelings about polenta. It’s something I always hope I’ll like, but I’m never wowed. I think it’s a texture thing, probably stemming from my mother’s strong distaste for hot cereal, which she passed along to her children. I’ve been practicing with oatmeal for years. I can manage toothy steel-cut oats but only when masked by dried fruit and a healthy dose of turbinado sugar and honey. David Lebovitz considers polenta topped with bitter greens and an egg to be comfort food. I would choose something hot, cheesy and gooey, like mac-and-cheese. Comfort food is a personal thing, so he’s entitled to his opinion. 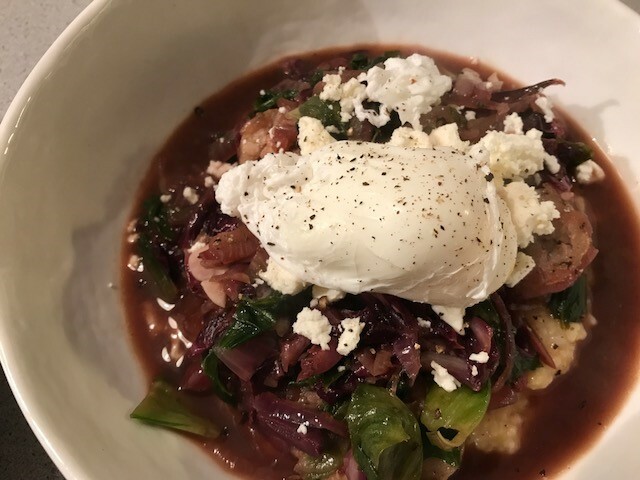 I’m also open to trying (and to some extent, retrying) new foods or new food combinations, so I added Buckwheat Polenta with Braised Greens, Sausage, and Poached Eggs to this week’s menu. This version of polenta included some cracked buckwheat to add a bit of texture. I love the bulk bins at Whole Foods where I can purchase the small quantities of polenta and buckwheat needed. I started with whole buckwheat and slightly ground it in the mini-chopper. When I’ve cooked polenta in the past, I remember it being tedious and temperamental like risotto. I was pleasantly surprised that the polenta cooked easily with frequent but not obsessive stirring. 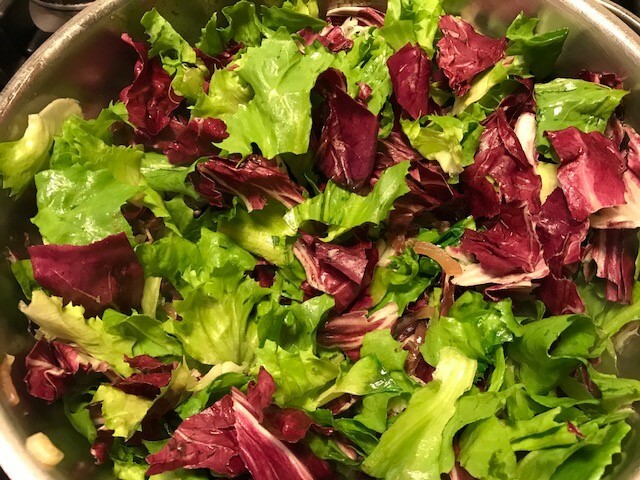 A mix of radicchio and escarole is braised until wilted. I was a little disappointed that the vibrant colored greens turned a shade of gray when cooked. Pan-fried slices of herby sausage and some slivered olives bulk up the topping. The final bowl is sprinkled with some feta cheese and topped with a poached egg. This made a hearty meal on a cold winter’s night, but it also confirmed that polenta just isn’t a favorite in our house. I completely skipped Cook the Book Fridays in October, so I made an effort to catch up. I can’t give enough praise to the Individual Chocolate Cakes with Dulce de Leche and Fleur de Sel. 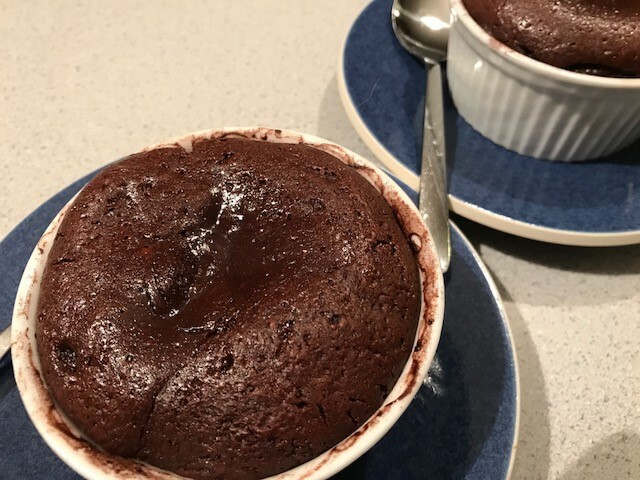 We’re huge fans of molten chocolate cakes, and this was an excellent variation. It’s nice to have a flourless (and gluten-free) option. And the dulce de leche filling hiding inside pushed this version over the top. I was happy to figure out that these little cakes can be assembled in advance and chilled until you’re ready to bake. 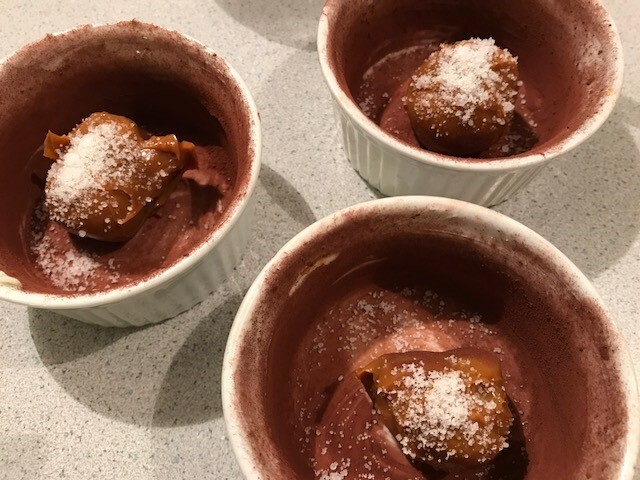 Great for entertaining or just having a weeknight treat ready to go. There’s lots more dulce de leche in the fridge, so I’ll be making these again soon. 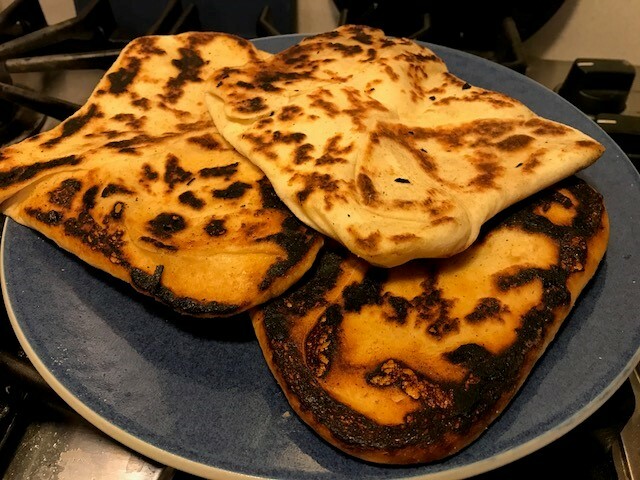 When the October recipe schedule was posted, I’ll admit that I was ambivalent about the Indian Cheese Bread (Naan au Fromage). I bought the Laughing Cow cheese, but never felt excited about preparing the recipe. Laughing Cow cheese did make me feel nostalgic. When I was growing up, this was most exotic cheese my mother bought. At that time, I think it was made in France. It was somewhat bland, but the individually wrapped wedges traveled well in my lunchbox. Finally, I found a day where the timing would work to make these flatbreads to accompany soup for lunch. 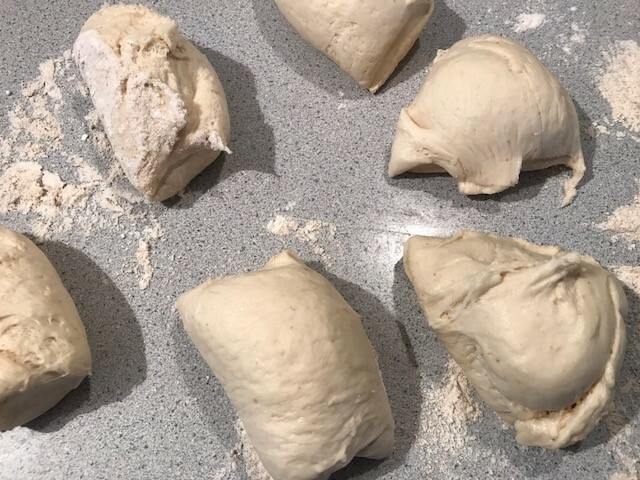 Minimal work is required to prepare the dough, especially when using the stand mixer. Most of the time is spent waiting for it to rise. 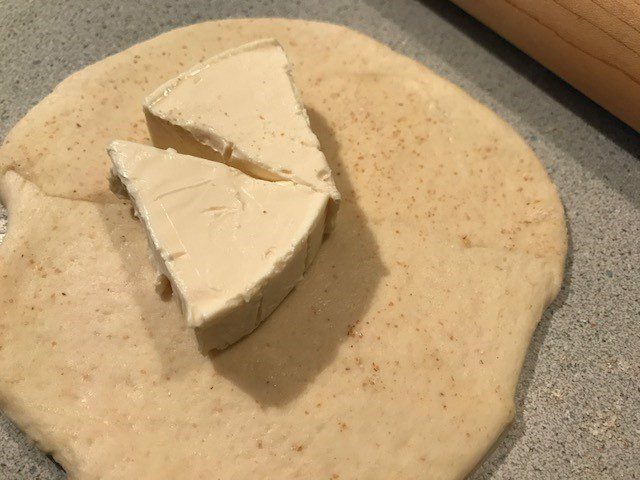 The dough was supple and glossy (from the butter) and rolled out easily. I was skeptical after wrapping the first flatbread around the cheese. Roll out this brick? The cheese is so soft that it was no problem. Surprise! Though smoky, it only took a minute or two to toast the bread in a covered cast-iron skillet brushed with clarified butter. The bread puffed up beautifully (though it flattened almost instantly). The folding and rerolling created layers so the bread was subtly flaky. I only had 8 wedges of cheese, so I made 4 with cheese and 2 plain. I folded the plain ones too to ensure the flaky effect. The flatbreads reheated nicely in the oven the next day. When I try new recipes, after evaluating the results, they end up in one of the three categories: Will Make, Might, and Won’t Make Again. The end results here is one of each. If you want to try any of these recipes, you can find them in David Lebovitz’s My Paris Kitchen. My friends at Cook the Book Fridays also share their reviews of the same recipes. If you want more opinions, look at their comments on Buckwheat Polenta, Individual Chocolate Cakes, and Indian Cheese Bread. Wishing all my American friends a Happy Thanksgiving! It’s my favorite holiday, and I can’t wait to prepare and enjoy the feast. Celery root aka celeriac, that gnarly gritty bulbous vegetable. Celery root is rather intimidating to look at, but inside is an ivory root vegetable that’s a savory treat. As the name implies, celery root and celery are related. They are two different forms of celery. In the case of celery root, its variety has been developed for the edible root. The stalks and leaves are edible too, chock full of celery flavor, though typically the stalks are spindly, not substantial, the way a head of celery grows. From March through November, I work as a volunteer at Lexington Community Farm on Thursday mornings. My tasks are varied, focused in the greenhouse during the winter months, moving to the fields as the season unfolds. Last week, I helped bag up vegetables for the farm’s post-season bulk fall vegetable sale. I was productive, bagging up 460 pounds of carrots (in 10 pound bags), 45 pounds of garlic (in 1 pound bags), and 55 pounds of celery root (in 5 pound bags) and a few more things that I can’t remember. 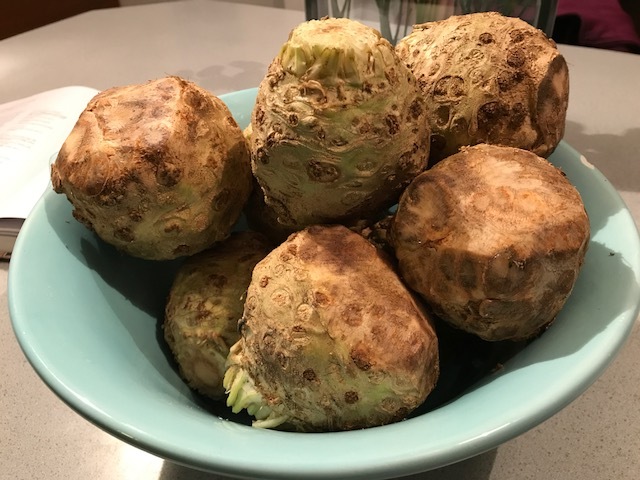 When I left, one of the farmers offered me a bucket of celery root that had been harvested the previous week so wasn’t up to snuff for selling in the stand. I’m not sure whether I knew this week’s recipe selection for Cook the Book Fridays at the time, but I happily accepted. 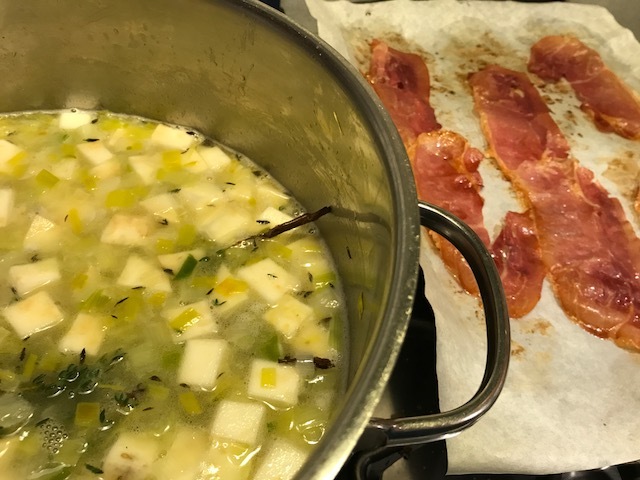 Celery root soup with horseradish cream and ham chips provides a perfect way to make a dent in my supply of celery root. The soup itself couldn’t be easier. Diced (and peeled!) celery root is added to sautéed leeks along with water, thyme sprigs, a bay leaf and salt and simmered until the celery root is tender. After removing the bay leaf and thyme stems, the mixture is pureed in the blender. Voilà! The result is a smooth ivory bowl of soup, which on its own is somewhat bland. However, it serves as a willing palette for garnishes. And the garnishes supplied in this recipe are outstanding. First, we have the ham chips which are a giant step up from bacon bits. I used thin slices of prosciutto, baked until leathery, about 10 minutes. They crisped up a bit more as they cooled. I coarsely chopped them. Next, we have horseradish cream. I went with the crème fraîche option. The recipe instructs you to beat the crème fraiche with a whisk until it becomes stiff. Because the crème fraiche has a lot of body to begin with, I was highly skeptical that whisking it would do anything. In fact, after whisking for a few minutes, it didn’t noticeably thicken. 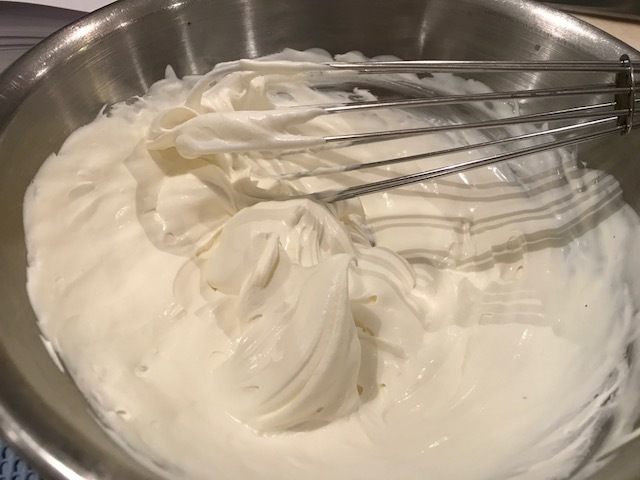 I kept at it, and, all of a sudden had soft peaks, similar to whipped cream. Interesting. 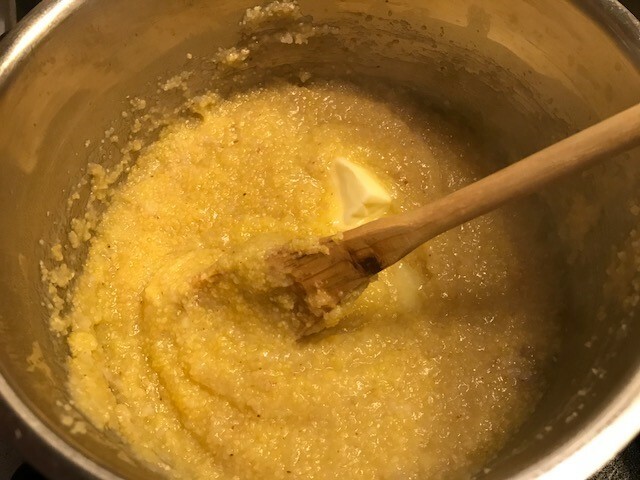 To finish it off, horseradish, salt and lemon juice are added for a piquant topping. I really enjoyed this one. 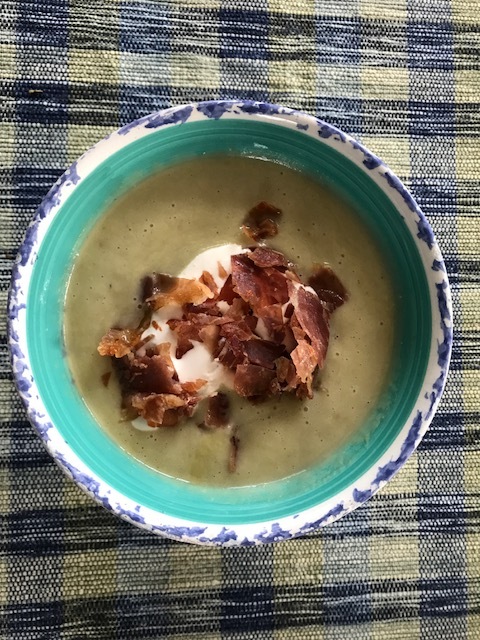 As I said, I found the “naked” soup boring, but with a dollop of horseradish cream and a sprinkle of ham chips, it is truly wonderful. To work through the rest of my celery root, I plan to try David Lebovitz’s Céleri Rémoulade recipe and this celery root gratin. Any other suggestions from fellow celery root fans? 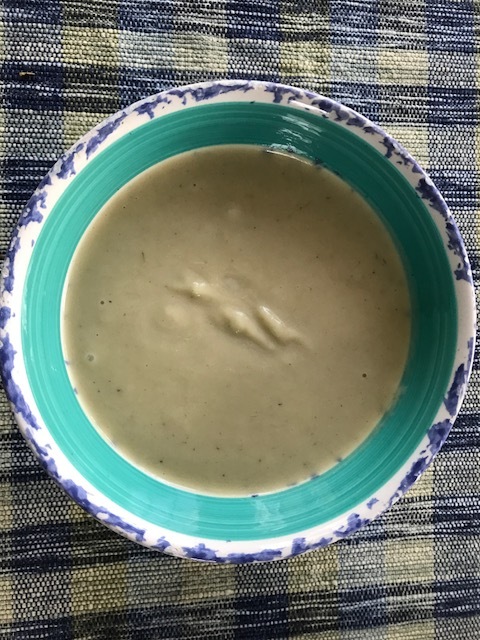 You can find the recipe for the soup on page 106 of David Lebovitz’s My Paris Kitchen. My friends at Cook the Book Fridays will also have something to say about their own renditions of the soup here. Lest I forget, the highlight of my week last week wasn’t packing vegetables (though Thursday morning at the farm is typically my favorite part of the week). The best part was a quick visit from my blogging friend Mary of Lights On Bright No Brakes. During her 30-hour stop in Boston, we cooked dinner together and spent the good part of a day perusing the galleries at Boston’s Museum of Fine Arts. We even snuck in coffee and pastries with our old pal Tricia (daughter of Ro from Chez Nana) from French Fridays who was also in town. 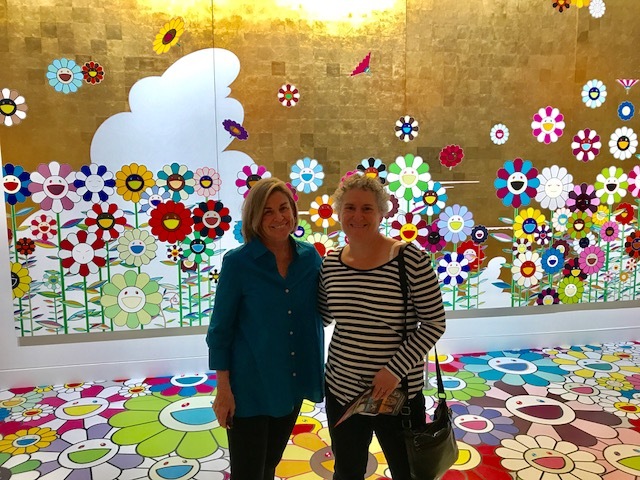 Here’s Mary and me in the Takashi Murakami exhibit. We loved his vibrant colors and sense of fun.